Place roast in large resealable food storage bag. Combine wine, soy sauce, garlic, rosemary, Dijon mustard, and dry mustard in small bowl. Pour over roast. Seal bag; turn to coat. Marinate in refrigerator 4 to 12 hours, turning several times. Preheat oven to 425°F. Spray 13 x 9-inch baking pan with nonstick cooking spray. Place potatoes, Brussels sprouts, and carrots in pan. Remove roast from marinade. Pour marinade over vegetables; toss to coat. Cover vegetables with foil; roast 30 minutes. Stir. Stir vegetables; continue roasting if not tender. 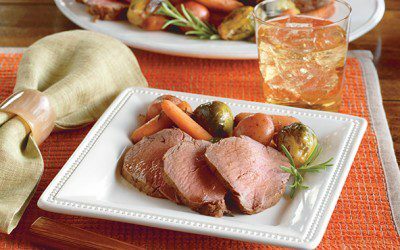 Slice tenderloin; arrange on serving platter with roasted vegetables. Serving size: 1/10 of total recipe (without gravy). Exchanges per serving: 1 Bread/Starch, 1 1/2 Vegetable, 4 Meat.